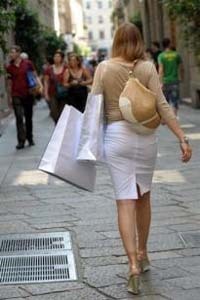 A woman walks with her shopping bags in "Via Montenapoleone" one of the luxury fashion streets in Milan in July 2008. Top labels revise their sales strategies to cope with the global financial crisis. Gone are the long lines in Milan's high fashion streets as top labels revise their sales strategies to cope with the global financial crisis. Sales have already begun in the chic district centring on Milan's Montenapoleone street, and not just for regular customers. Even at Prada, discounts are up to 40 percent. "Even major luxury labels have launched more affordable lines," said Paolo Fontanelli, managing director of leather goods purveyor Furla. "That shows you where the demand is." The venerable company with nearly 300 stores worldwide and a turnover of around 150 million euros (200 million dollars) is not immune to the crisis. "The business plan that we presented in June 2007 needs to be revised," Fontanelli told AFP. "Like our competitors, we will work on the basis of two scenarios, one that is very realistic and pessimistic, and the other a bit more optimistic," he said. "We haven't frozen our investments, we've just rescheduled them. We have become more selective about opening new stores," Fonanelli said. Then, sounding optimistic, he added: "That doesn't make us miss opportunities, because thanks to the crisis we can find good spots that are a lot less expensive." With sales of upmarket "Made in Italy" down by some three percent over the first nine months of the year, Italy's textile and fashion federation, together with the employers association, have set off the alarm bells, calling for government support. The global financial crisis has not spared the well-to-do in emerging economies despite a recent boom in demand for Italian luxury goods, according to a consultant for Russian retailers. "It's a disaster. Russian buyers have abruptly cut off all of their orders," he said. "They used to pay up front in cash, so clothes companies could go ahead and produce. Now everything is held up." Leading knitwear maker Lineapiu is one of the main victims of the crisis, having sought bankruptcy protection early this month. It Holding, with Gianfranco Ferre and Malo among its labels, is negotiating for a partnership with a Chinese company. The crisis is inspiring new types of sales strategies, such as online or "travel trade" at airports. "We can no longer just wait for customers to come into the shop," said Michele Norsa of Salvatore Ferragamo at the recent Milano Fashion Global Summit. "You have to go where they go."